to life in Clackamas County. As a 501(c)3 nonprofit, we depend on the support of donors like you. Become an annual donor and enjoy the benefits! Early-bird notice and advance sign-up of public events, lectures, workshops, and artist demos before they sell out. Collage a bird at our next workshop with artist Susan Schenk on Thursday, May 9, 6-8 pm. Register now! 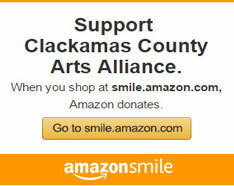 Discount on submission fees for annual Clackamas County artist and poets calendar (call for work is in April! ), envelope gallery notecard competition (call for work is in July! ), and donors exhibition. Match your Arts Alliance gift with an Oregon Cultural Trust donation and claim your entire Trust contribution as a tax credit! Other ways you can support CCAA All Year Long!